The national flag of Sri Lanka, also called the Flag of the Lion, is composed of a golden lion holding a sword in its right foreleg, in front of a crimson background, with four golden leaves of Ficus religious, one in each corner. Around the bottom there is a yellow border, and to the left there are 2 vertical stripes of equal size in saffron and green, the saffron being closest to the lion. The national flag of Sri Lanka represents the country and the union between the different ethnic minorities. 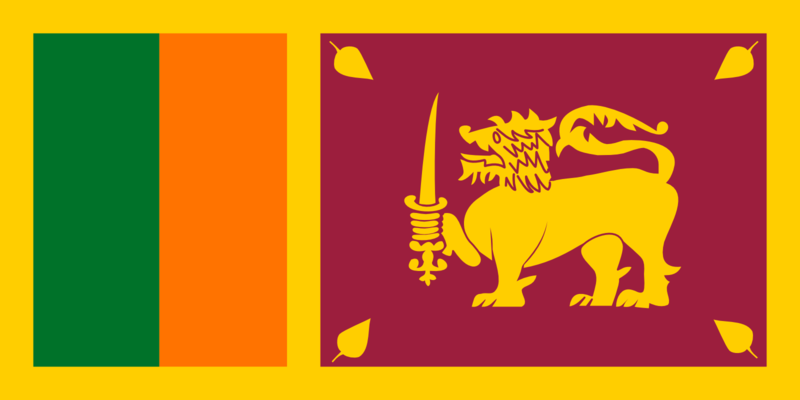 The lion on the national flag of Sri Lanka represents the Sinhalese race. The lion’s sword represents the sovereignty of the country. The hair curly lion’s head indicates religious observance, wisdom and meditation. The beard denotes purity of words. The hilt of the sword highlights the elements of water, fire, air and earth. The two front legs are purity in the management of wealth. The orange vertical band represents the minority Tamil race and the green belt the Muslim minority. The four virtues of good: kindness, kindness, happiness and equanimity are also represented on the flag. The frame around the flag, which is yellow, represents other smaller breeds. The leaves of boxwood at the four corners of the flag represent Buddhism and its influence on the nation. They also represent the four virtues – kindness, kindness, joy and equanimity. The garnet colored part of the flag represents the smaller religions. The national flag of Sri Lanka is an adaptation of the civil flag of the last Sri Lankan king, Sri Wickrama Rajasingha. The civilian flag had a royal running lion with a sword on its right foreleg, and boxwood on each of the four corners of a plain edge. When Sri Lanka gained independence from Britain on 4 of February of 1948, Lion flag was the last king of Sri Lanka was raised again. Prime Minister of Sri Lanka Independent, DSSenanayake, appointed a committee to advise the government on the design of a new national flag. The design approved by the committee in February 1950 retained the lion’s symbol with the sword and bo-leaves of the last King of Sri Lanka’s flag, with the inclusion of two vertical stripes of green and orange. The national flag was hoisted for the first time 3 as March, 1950.